Considering how often I’ve heard people profess a desire for such a pistol, it’s surprising to come across such a gun for the first time ever. It uses 5 shot 38 wadcutter magazines from Clark Customs. Custom work by Sam Hoster. 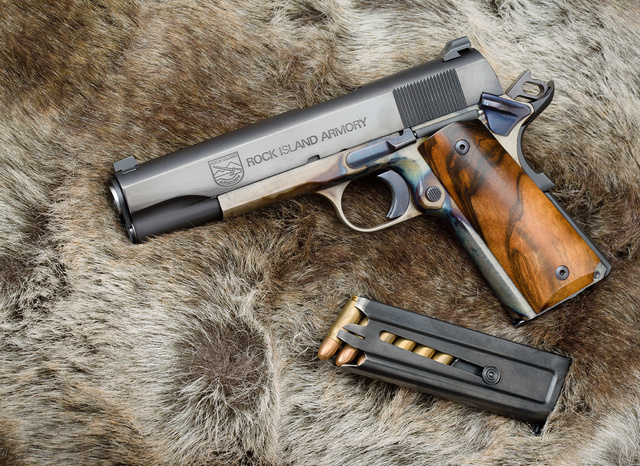 This entry was posted in ammunition, pistol, weapon and tagged 7.62x25, custom, M1911. Bookmark the permalink. That’s pretty awesome. I saw the mag in the pic before I actually read the article, and said, “Hey, that looks like it holds .38 wadcutters.” How many people would recognize that? My brother in law has an old Colt that was chambered in .38 wadcutter. The work was done by Alton Dinan, a renowned Smith in another age. My BIL picked it up at a local gun shop, and paid around $400, for something that ended up being worth two or three thousand dollars. Colt had their own .38 Special “Mid Range” wadcutter pistol, the Mark III National Match. The magazines are undoubtedly meant for it. Oleg, the S&W Model 952 was designed to hold 9mm Luger Parabellum rounds. It was a newer version of the venerable Model 52, intended to reintroduce the shooting public to the refinement and accuracy that was the Model 52. The S&W Model 52 was the .38 Special version, and their magazines only hold 5 each .38 Special wadcutters, flush-seated. I know, because I’m the owner of a very low serial number Model 52, one of only 3,500 produced. Do you have that image in a larger size? That’s majorly cool! Click on the photo to see it larger. Email me if you want the 36MP image. Also, Oleg, would you mind if I reblogged this image? FWIW: The Chinese and North Vietnamese converted more than a few captured M1911 to 7.62x25mm, but the converted frames ended up with wafer thin front straps. It strikes me that one of the older fat front strap frames like the 1990s vintage Springfields or 1980s vintage Caspians could be notched out for use with modified TT33 or Zastava M57 magazines. I find it amusing everyone gasps astonished at this great technological breakthrough. Pfaugh! I’ve been shooting 7.62×25 in my Colt Commander for over a decade with minimal mods. All you need is a 9mm slide, a 7.62×25 barrel and a few grains of brains. The key, grasshopper, is not to make the gun fit the ammunition, but the other way around. We shall now have silence for the enlightened to ponder and the dim to wonder. 7.62x25mm is quite a bit longer than 9mm. Maybe the ammo would fit into a 9mm magazine if it was at an angle, but what about reliabilitY? You use .38 Super magazines instead of 9x19mm. The 9x19mm slide provides the closest match for the 7.62x25mm casehead, although .38 Super slides would work as well. J&G Sales has been offering the conversion barrels for a couple of years now. J&G has found that .38 Super magazines will accept 4 to 8 rounds of standard 7.62x25mm ammunition. Obviously, the magazines can hold more if you are willing to handload to a shorter over-all length. The more adventurous even bump back the projectiles in factory ammunition, although this may be ill-advised. Rock Island Armory (Marikina, Phillipines) has been getting better and better at their trade. That kind of looks like Cocobolo wood on the grips, very handsome.